Polished single terminated mini - points of genuine Rhodonite are held by intricate bead and scroll work caps. Points are 7/8" long. Proudly handcrafted in the USA of fine .925 Sterling Silver. Earrings have French wires and measure 1 1/2" L - 1/4" W.
Don�t forget to also order our Clear Rubber Earring Backs/Clutches to keep your earrings secure! They are available in single pairs, or in sets of 10 or 25 pairs � just click on the appropriate link below to order the desired quantity. 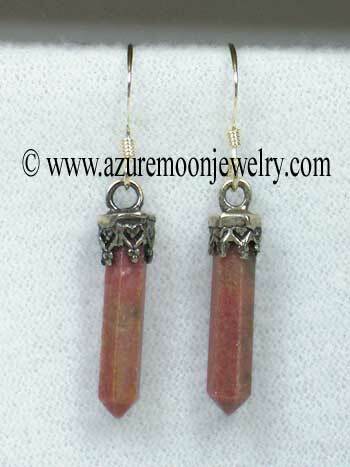 Rhodonite is a fourth (heart) chakra gemstone. Metaphysical Properties: Rhodonite is called a "stone of love" and it helps one to achieve their greatest potential. 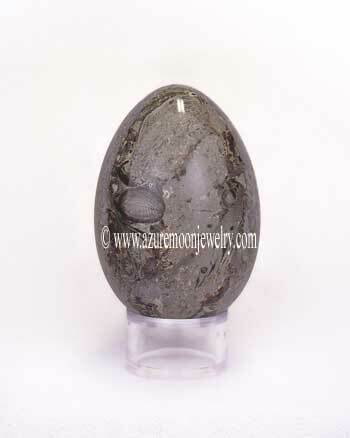 It activates and energizes the heart chakra, dispels anxiety and promotes coherence. Click here to learn more about the lore and metaphysical properties of Rhodonite and other popular gemstones.